DevilsOwn Alcohol/Water Injection kit designed just for the VW TDI and Gas turbo charged engines. If ordering for a TDI you will want the DO4 and DO5 nozzles, For a GAS turbocharged engine the DO3 and DO4. The DevilsOwn Progressive alcohol/water injection kit's main function is to suppress detonation caused by high temperature and pressure developed in the combustion chamber when the effective compression ratio has been taken beyond the auto-ignition point by either a turbo or a supercharger. Compressed air is heated air that causes power robbing and engine destroying detonation. Cool the air with the DevilsOwn alcohol/water injection kit! Water, with its high latent heat content, is extremely effective for controlling not only the onset of detonation but also the production of oxides of nitrogen in modern lean burn engines. Methanol, with its 116 octane, high flash point and specific gravity, further reduces the chances of detonation. Designed specifically for those who want to use their existing windshield wiper fluid tank located in your engine bay or have provided your own tank. So it provided with 15ft of nylon tubing, more can be purchased from our store if mounting the tank in the trunk if needed. 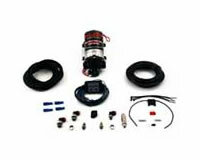 This kit comes with hardware, electrical connectors, and fittings need to install this kit. The electronic progressive controller represents the latest technology in Water/Methanol system control. The dvl-2002 is designed to increase injection pressure over a user adjustable range and quickly shut off when boost pressure drops to prevent misfire.